An in-depth account of a cruise between Venice and Mantua on a hotel barge of European Waterways, with a day-by-day cruise photo diary. ABOVE: La Bella Vita in Venice, Italy. INSET BELOW: The barge's logo on a crew polo shirt, and departure from Venice's Riva di San Biagio. Barge cruising has long attracted connoisseurs of low-key luxury cruising in France, Belgium, the Netherlands, Germany, and the British Isles, where converted industrial barges (some nearly a hundred years old) offer a relaxing, slow-motion experience on canals and rivers. Still, even the most loyal barge aficionados can be tempted by new experiences, and La Bella Vita--a hotel barge based in Venice, Italy--brings a fresh Italian flavor to inland cruising. La Bella Vita was built in 1960 as the sand barge Mery, and it hauled bulk cargo up and down the rivers and canals of Italy's Po Delta for 50 years. In 2010, the barge was acquired and refitted as a cruise vessel by European Waterways, a company that operates luxury hotel barges in nine European countries. 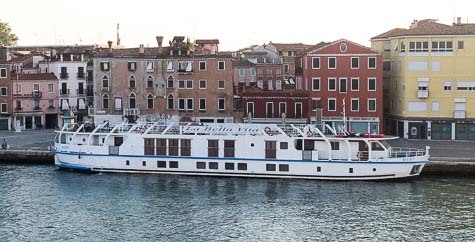 Today, the 20-passenger barge offers six-night cruises from Venice to Mantua (or vice versa), with stops along the Venetian Lagoon and Po River. We cruised on La Bella Vita in May, 2013 at the invitation of European Waterways, with whom we'd cruised on the luxury hotel barge Renaissance in Burgundy several years earlier. In this illustrated article, we discuss the barge, our itinerary, the overall cruising experience, and how traveling by barge compares to cruising on a larger river vessel or an oceangoing ship. We've also provided a day-by-day cruise photo diary with nearly 150 images and detailed captions to help you decide whether a six-night cruise on La Bella Vita (or even a whole-boat charter) is right for you. Is La Bella Vita right for you?